The apartment Parque Santiago 3 is located in a well maintained complex overlooking the sea and on the beautiful beach of Plya de Las Americas. All shops, restaurants, hair salons, banks and ATMs can be easily reached on foot. The apartment has a separate bedroom with a double bed and a modern living room with sofa bed and comfortable leather armchairs. From the balcony you have a beautiful view of the sea and of the high street. The balcony is furnished with chairs, you can sit there in the evening with a glass of wine and enjoy. The living room has a flat-screen TV with satellite channels and a small stereo system. The comfortable sofa can be converted in a few steps to the sofa bed. The bedroom has a second TV, which also receives all major international programs. The kitchen has a ceramic hob, oven, fridge, freezer, microwave, and toaster, kettle and coffee maker. Internet is available via Wi-Fi free of charge. There is also a washing machine and ironing facilities. The apartment is ideal for swimming and beach vacation, even for a longer stay, it is ideally suited. The plant has a very nice pool area with a separate water park with water slides for the kids. The pool is also a bistro for snacks and ice in between (surcharge). The apartment Parque Santiago 3 is located in the Parque Santiago III. The facility is located in the most central and sunniest area of ​​Playa de las Americas, the holiday paradise in the south of Tenerife. Right on the so-called 'golden mile'. Directly in the complex there is a shopping center with a total of 153 different stores that have something for everybody matching on offer. 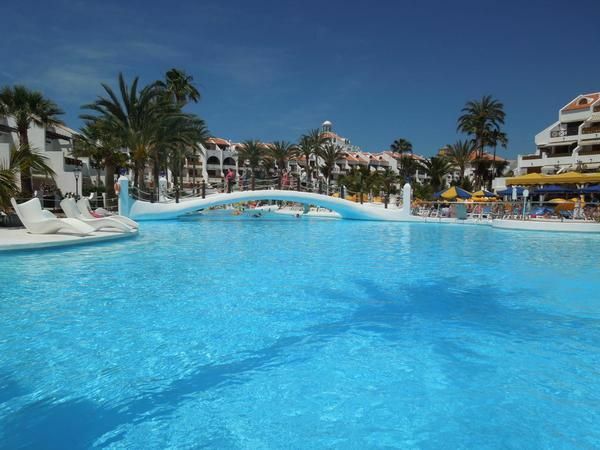 Almost right on the beautiful beach of Playa de las Americas, this apartment is in a very central location of the most popular holiday resort in the south of Tenerife. The complex has a large swimming pool. There is also a children's pool, a water playground for children with water slides, a poolside bar, and a cafeteria where you can eat a small snack between meals. The area of ​​the entire plant is 47,000 square meters. Within the complex there are bars, restaurants, a snooker shop, and several hair salons. The family atmosphere makes for a relaxing and enjoyable break. From the balcony you have a beautiful view on the sea and the shopping street, inviting with many restaurants and shops for shopping and strolling. Enjoy the landscaped environment with a walk on the beach promenade, which is several kilometers long and stroll along the most beautiful boutiques and shops. In the area you will find some of the trendiest restaurants on the island. For fishing and ferry port of Los Cristianos walk on the promenade in about 10 minutes. The plant is one of the best places in Tenerife for a beach holiday. All golf courses are within a few minutes by car. The nearest golf course is only about 600 meters away (Playa de las Americas Golf Court). Even the largest water park in Europe - Siam Park - is only a short drive away, as is the Aqua Park, Jungle Park and the Parque Las Aguilas (an eagle park above Chayofa). Final cleaning: once per object Costs amounting to 85 EUR (Mandatory).